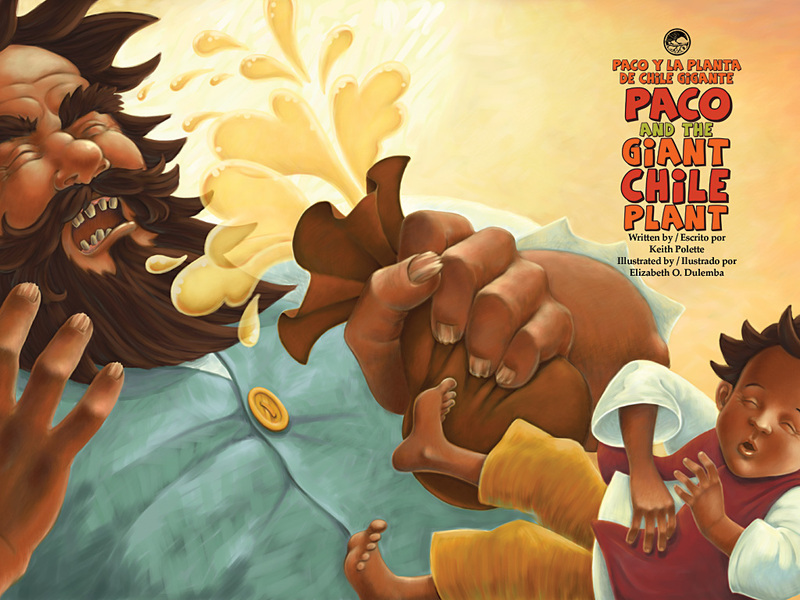 Paco takes the familiar "Jack and the Beanstalk" tale and gives it more than a few new twists. Told as a fractured fairy tale, our hero, Jack, is now called Paco, and the story takes place in a beautiful desert setting in the American Southwest. The story is presented as an English text with embedded Spanish in rojo. 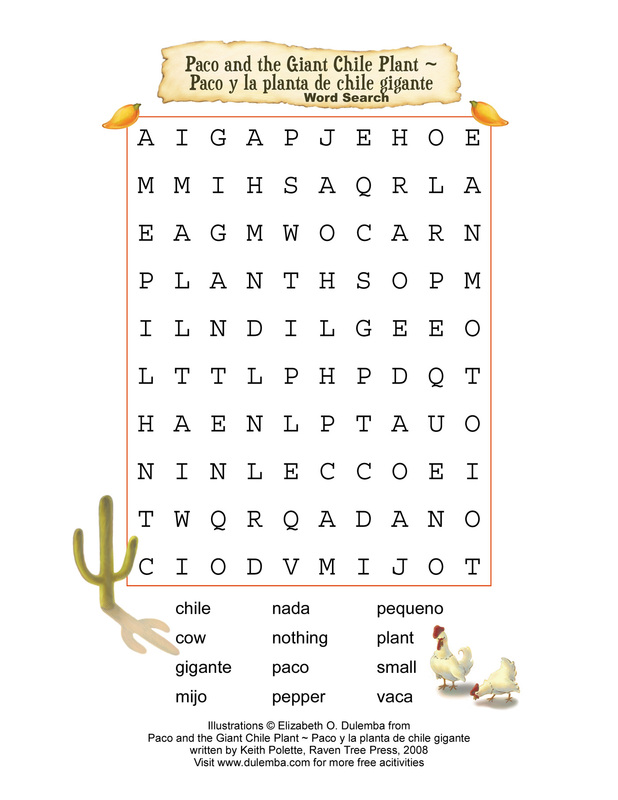 A vocabulary page is included to jump start learning in either language. News Flash! Paco is now available as a Ripple Read to Me Book. Record your own voice reading the story and share it online with those you love near and far. Right click on an image below (under 1mb) to download it for your desktop. 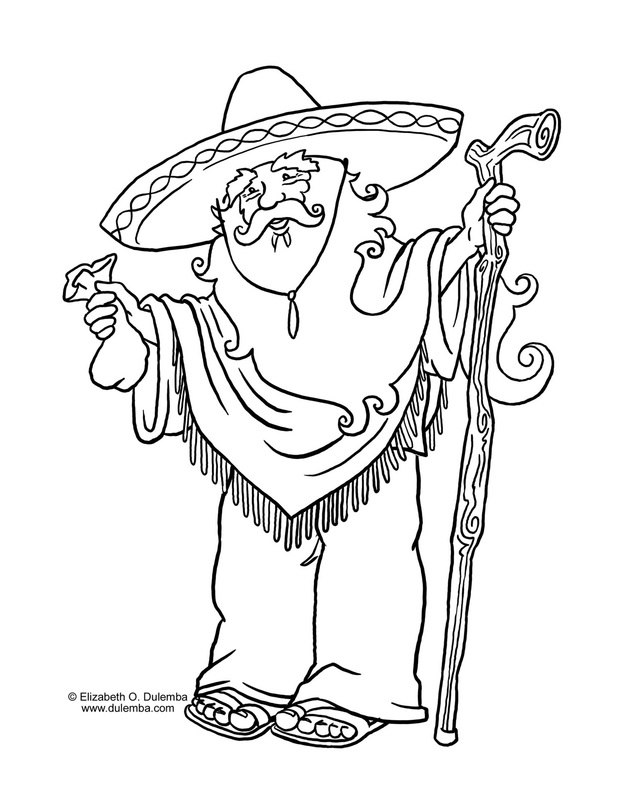 Click on an image below to download a jpg to color (under 1mb). Click on the puzzle to download a PDF (about 400k). Microwave a tortilla on high for five seconds to make it easier to work with then lay it flat on your work surface. With your rubber spatula, spread cream cheese onto the tortilla all the way to the edges. Try to get as little liquid as possible and spoon a stripe of salsa onto the tortilla. 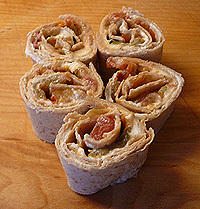 Roll the tortilla as tightly as you can. this recipe (60 kb .pdf), click here. Paco has been awarded the bronze medal in the 2008 Moonbeam Children's Book Awards! 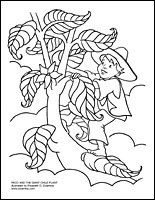 Should young Paco swap the family cow for chile seeds, plant them, and then climb to the top of the chile stalk where an evil giant lives? 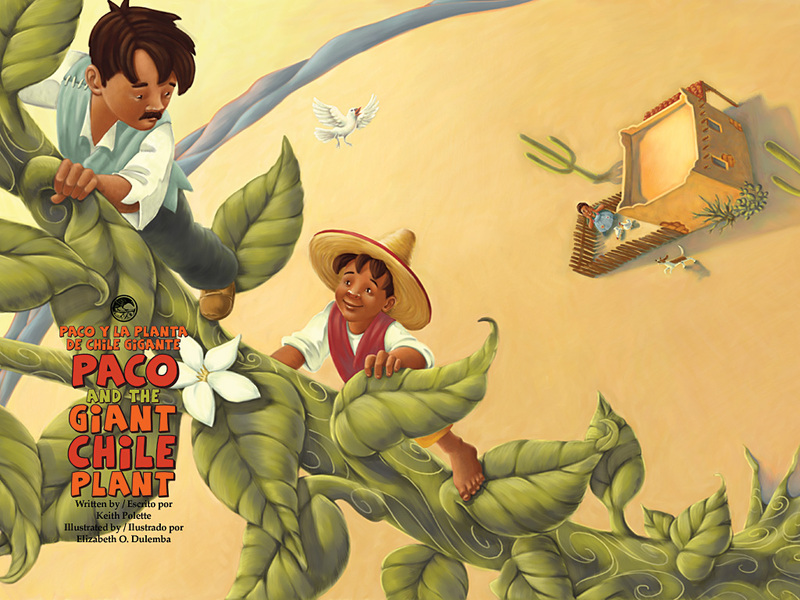 With Latino flair, this folktale offers a pleasant twist to the traidional Jack in the Beanstalk, while providing a superior moral and answering the age-old question of whatever happened to Paco's papá. Polette skillfully interchanges English and Spanish words to help readers learn key context vocabulary (also defined at the end of this cuenta). Dulemba uses PhotoShop and a palate of desert colors to visually intensify the tale's Mexican sabor with soft illustrations exuding a vintage feel. Recommended. What a wonderful story. The author did a fabulous job taking what most of us assume is just a Spanish-added version of a classic story and truly making it her own. She did a masterful job blending Spanish into the story, offering repetition in English and Spanish together. As good as the story is, I could turn the pages just to look at the illustrations, too. On one page, el gigante terrible is reaching out to the reader! Everyone will enjoy this new ending to a classic story. The illustrations, combined with well integrated Spanish, make this a must-read for elementary-aged children. Buy. This is a wonderful book and a nice twist on a classic tale. The illustrations are exceptional and children (especially young boys) will see themselves in Paco: curious, drawn to magic, and a hero. 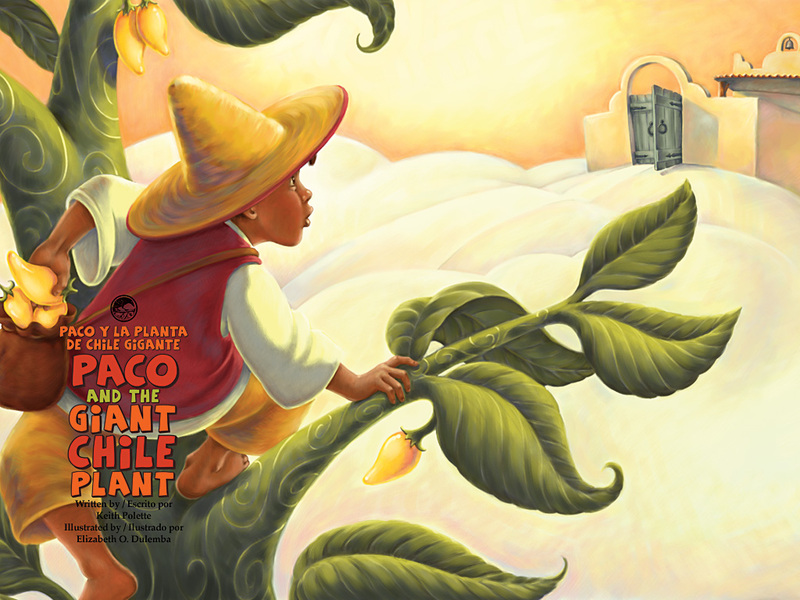 Paco and the Giant Chile Plant (Raven Tree Press, 09794462-3-8) incorporates Spanish words into a surprising revision of “Jack and the Beanstalk”: “Paco harnessed la vaca and led it down the dusty road. 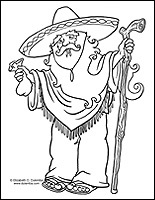 At a dip in the dusty camino, Paco met an old man.” A glossary at the back will help unsure readers, but it is hardly necessary for understand the story. Keith Polette is an educator and literacy specialist who is known for his multicultural approach to teaching. In addition to his many books on education, he also wrote Isabel and the Hungry Coyote. Elizabeth Dulemba captures the feel and palette of the desert with her folksy digital artwork. Paco and his mother had nothing but a cow, which Paco ended up selling for magic chile seeds. So begins this delightful spin on the Jack and the Beanstalk tale that emphasizes the importance of family and leaves the reader with a smile of satisfaction. I liked this twist much better than the original. The interplay of English and Spanish within sentences helps the readers become acclimated to both languages along with learning new words. A very interesting method of introducing a different language. There is also vocabulary page at the end. The whimsical illustrations only add to this family-friendly tale. Recommended for homes, schools and more. 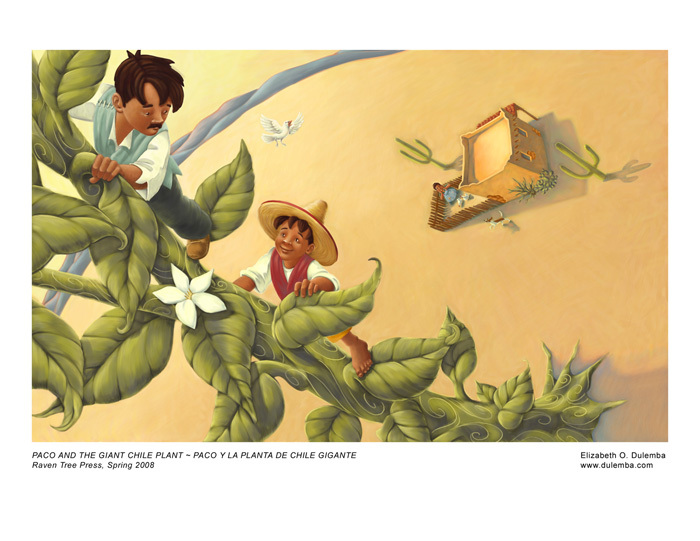 In a re-telling of Jack and the Beanstalk, Paco trades his family's only valuable possession for a bag of chile seeds. 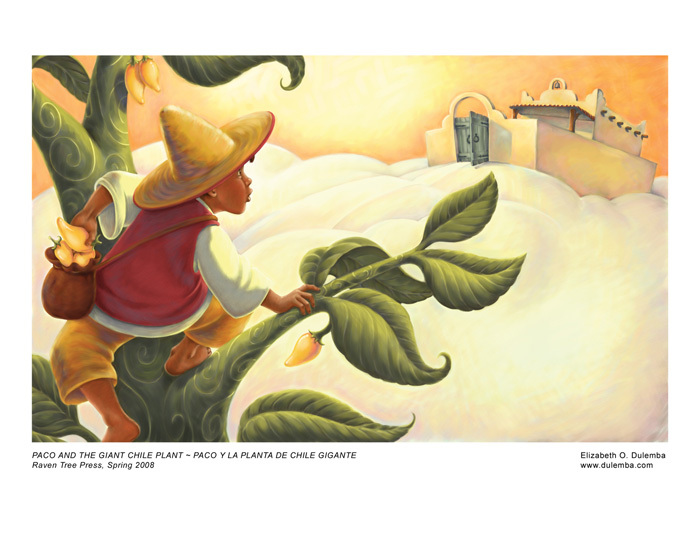 Naturally, the seeds grow into a giant chile plant, which Paco scurries up to find a world of clouds surrounding a great house. It's not hard to predict the discovery of a giant within the house, but an interesting twist for some readers will be the giant's threat, changed to reflect his new cultural background. "Fee, Fi, Fo, Fum, I smell the blood of a human one. Be he thin or be he fat, for my tortilla, I'll grind him flat!" It sounds silly, but the best stories and biggest hits with kids seem to be the stories that take them by surprise. This story definitely will. Keith Polette's lyrical text is interspersed with Spanish terms, translated casually from English as the story builds, so that children naturally understand their meaning in context. Elizabeth O. Dulemba's illustrations easily match the theme of the book, using warm golden tones to highlight Paco's great expectations. The glowing eyes of Paco and the ragged fingernails and snaggled teeth of the giant do much to bring both characters to life on the page. I'm impressed with the initiative of Raven Tree Press with their bilingual line, and I look forward to reviewing more of their books. With the growing number of Spanish speaking households in the United States, Raven Tree Press recognizes the need for high quality reading materials in a variety of bilingual and wordless formats. By presenting English and Spanish in the same book we believe speakers of both languages learn faster. It also allows multicultural awareness, language development and a learning process important to our global community. This book comes highly recommended by this reviewer and her children. - Jennifer LB Leese, The Picket News, It's Only Ink! 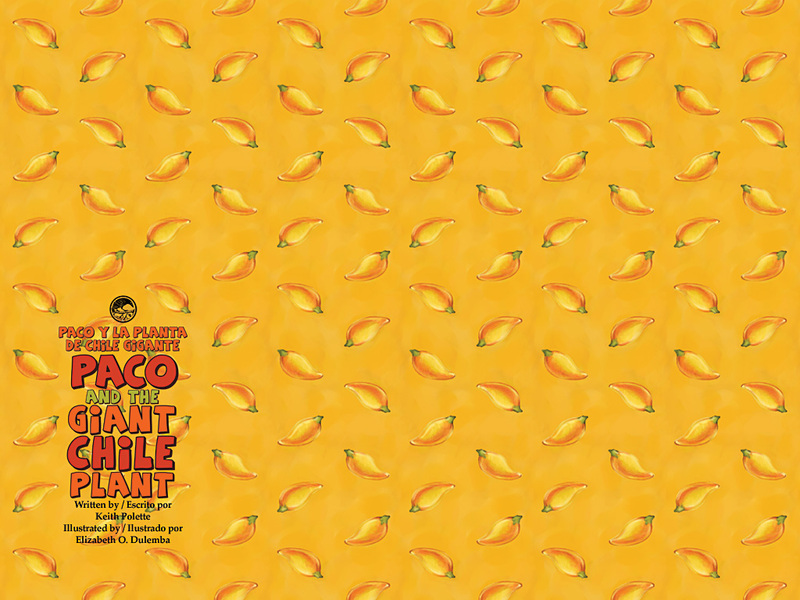 Hot and spicy chile beans…and Paco! When I first read the title I wondered why anyone would recreate the Jack and the Beanstalk fairy tale. After reading it, I realized the unique added twists to this story compounded by the Spanish words tossed here and there gave it a thoroughly different flavor. Meet Paco and his mother, who have no choice but to sell their ‘vaca’ (cow) in order to get some ‘pesos’ to survive. The beginning, although similar to the famous tale, reads differently because of the strewn Spanish words. By the middle, the reader is in for a delightful twist. I didn’t see it coming and that’s why I fell in love with Paco and the Giant Chile Plant. I highly recommend this children’s book, beautifully illustrated by Elizabeth O. Dulemba. This is basically a Mexican version of the traditional Jack and the Beanstalk story. Although it is a Mexican adaptation it is written in English with an occasional word in Spanish. 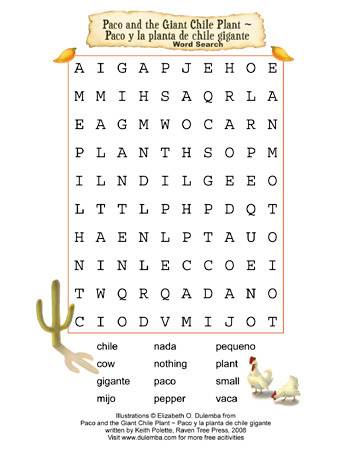 For each Spanish word the readers can figure out the definition based on the context. 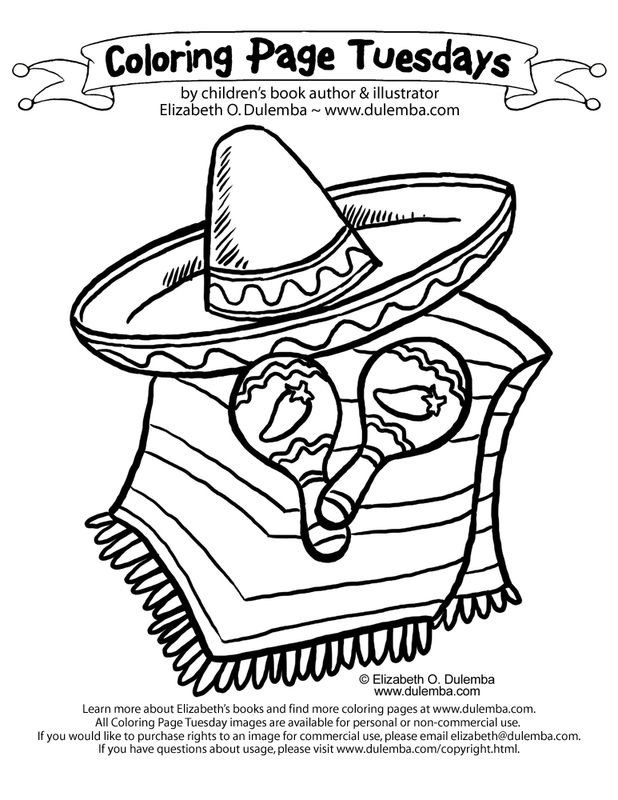 The author introduces a vocabulary of 32 Spanish words to help young readers learn Spanish in a easy, intuitive way. 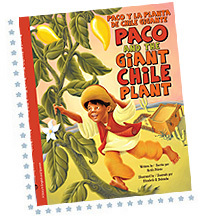 Paco and the Giant Chile Plant is recommended. I really liked how the Spanish words were sprinkled into the story, rather than it being told first in English, then in Spanish as many bilingual books work. - Amanda, "A Patchwork of Books"
I just received this in the mail. What a wonderful book!! I really enjoyed it and did my children. We are currently studying spanish and this is a nice way to include vocabulary while telling a story that they know and love. The illustrations are wonderful and my children have asked for it to be read again-already! Just loved this book! A lovely twist on a classic fairy tale. I live in Los Angeles, so the clever way Spanish and English are mixed together was very fun for me, and also for my niece, who is much more fluent in Spanish than I am. Also loved the illustrations. They seemed to also be a twist on the classic, and made me smile. Think the book is very well done. A sweet treat! Mucho Gusto! 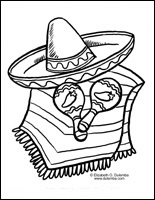 Paco and his mother have no pesos, but they do have plenty of adventure once Paco trades his vaca for some magic semillas de chile. This bilingual retelling of Jack and the Beanstalk while faithful to the original tale has some new twists as well. 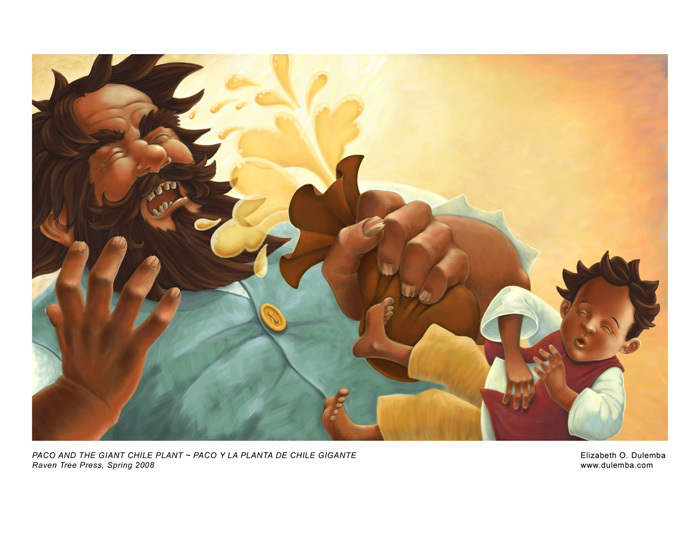 As Paco attempts to flee from the giant, juice from the golden chiles burns the giant’s eyes, his tears cause him to shrink and he becomes Paco’s father. 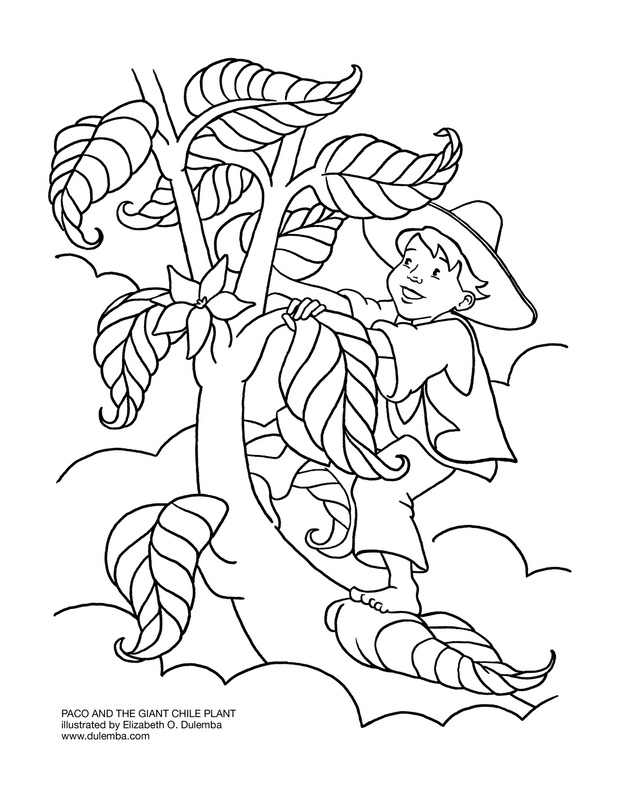 Although they must cut down the giant plant before finding the treasure, the family believes all will be well because Papa is now reunited with his family. The story is well written and the attractive illustrations are faithful to the story’s southwestern setting. The Spanish vocabulary is skillfully interspersed in the story so that it can be easily read and understood. A glossary is provided to clarify words that may not be evident from the context. Highly Recommended. Blog Book Tour for me and Paco!